Fans of opera can expect to see more Korean singers performing local productions. 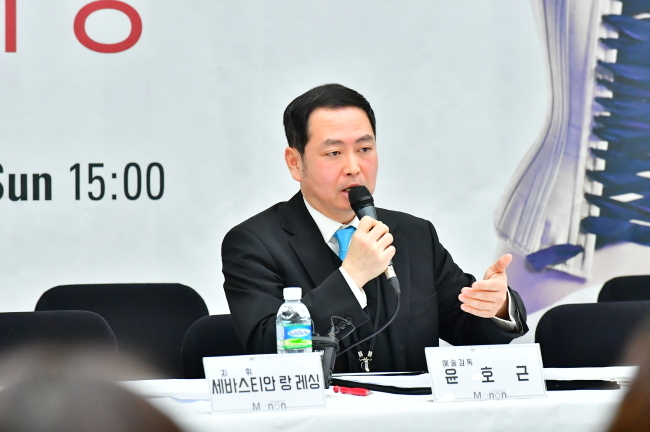 Artistic Director of the Korea National Opera Yun Ho-gen pledged to introduce more Korean productions and original Korean operas during a press conference held in Seoul to promote the company’s upcoming “Manon.” Yun was appointed to the post on Feb. 9. Dismissing concerns about the lack of extensive experience in the Korean opera scene, Yun said his 12 years of experience overseas had triggered him to ask himself where Korean opera should be headed. Yun vowed to introduce more Korean operas and Korean singers. Over the years, the KNO has been criticized for focusing on bringing in productions and singers from abroad rather than nurturing the local opera infrastructure and talents as a state-led institution. Acknowledging the KNO’s crucial role and presence in the country’s opera scene, Yun said he would strike a balance in staging Korean productions between historically important ones and those that have never been performed in the country. There are some 300 original Korean operas, though only 10 or fewer works continue to be performed, according to a source familiar with the matter. Meanwhile, the KNO will stage “Manon,” Jules Massenet’s production that first premiered in 1884. The upcoming “Manon” performance will mark the second time it is being performed here. It had its Korean premiere in 1989. Conductor Sebastian Lang-Lessing and French director Vincent Boussard have joined the production of Massenet’s opera, which is characterized by its unique musical and linguistic tonality. “Manon” will be staged from April 5 to 8 at Seoul Arts Center Opera House.